Professional results, unparalleled control, and maximum operator comfort are all available with this Gravely ZT X 42 inch Zero Turn Mower. A 42 inch fabricated cutting deck maximizes air flow for optimal cutting performance and allows you to choose between 13 different cutting heights ranging from 1.5-4.5 inches on the Cutting Height Selection Dial. You can get your job done quickly while reaching speeds of 7 mph with the Hydro-Gear EZT transmission that offers maximum control and stability. Finally, mow all day with the high back seat with springs to reduce vibrations and operator fatigue, adjustable control arms, vibrating floor mat, and the convenient arm rests for extra added support. Kohler 7000 Series Pro Engine: All the cutting performance power you need is delivered by the Kohler 7000 Series Engine that is equipped with simple Smart Choke easy starting technology and can reach up to 25 HP. Hydro-Gear EZT Transmission: Unparalleled control is offered with the Hydro-Gear EZT transmission that allows you to reach forward speeds of 7 mph and reverse speeds up to 3 mph to get your job done quickly. 42 inch Fabricated Cutting Deck: A professional grade cut is available using the best in class Height of Cut Selection Dial, located near the operator's position, to choose from 13 different cutting heights ranging from 1.5-4.5 inches. The 42 inch fabricated deck is designed for maximum air flow to provide an optimal cut every time. Lower the blades from the operators position using the electric Warner blade engagement and lower/raise the deck with a convenient foot-operated deck lift. Adjustable Control Arms: For more comfort the the control arms can be adjusted in three different locations and flipped out for easy entry and exits. Large 18" Rear Tires & Anti-Scalp Wheels: Leave uneven lawns unharmed with the 18 inch rear wheels that provide added traction and full-sized anti-scalp wheels. Fully Tubular Frame: The fully tubular frame offers welded joints that provide structural stability and added strength for many years of performance. Rubber Foot Mat: Operator comfort is also added with the rubber foot mat that reduces dissipates the vibrations for less operator fatigue. Receiver Hitch: Double the use of your mower with a convenient receiver hitch so you can tow equipment behind, using this mower for more than just cutting your lawn. Operator Comfort: A high back seat with springs fits any operator size for maximum comfort and armrests provide extra support for all day mowing. Warranty: Rest assured while you are mowing with the 3 year factory warranty. 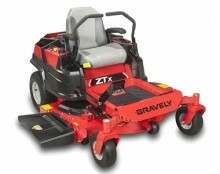 Click the button below to add the Gravely ZT X 42 inch 24 HP (Kohler) Zero Turn Mower to your wish list.